I borrowed a copy of this book from my local public library to write this review. Note: Louise is reading and composing all the reviews while Cathy is on sabbatical. Cathy returns February, 2018. 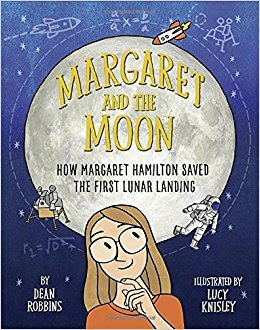 Dean Robbins, (Two Friends: Susan B. Anthony and Frederick Douglass) has done a fantastic job in this engaging picture book biography about an inquisitive woman who grew up during the 30’s and 40’s to write code for the computer commands on the Apollo missions. Margaret Heafield Hamilton “loved to solve problems. She came up with ideas no one had ever thought of before.” She also asked lots of questions. “Why didn’t more girls grow up to be doctors? Her solution to answering those questions, and more, was to study. A comic book artist, Knisley's illustrations, rendered in ink, paper, and colored in Adobe Photoshop, perfectly complement the text, offering an element of excitment. I love her full-page art. This is an excellent addition to science collections. FYI: When I searched for more information about Margaret Hamilton in several encyclopedias (Britannica, Funk and Wagnall’s, and World book) she is not listed. The only source of information was Wikipedia.